"Night owls"—people who like to stay up late and have trouble dragging themselves out of bed in the morning—have a higher risk of dying sooner than "larks," people who have a natural preference for going to bed early and rise with the sun, according to a new study from Northwestern Medicine and the University of Surrey in the United Kingdom (UK). The study, on nearly half a million participants in the UK Biobank Study, found owls have a 10 percent higher risk of dying than larks. In the study sample, 50,000 people were more likely to die in the 6½ -year period sampled. 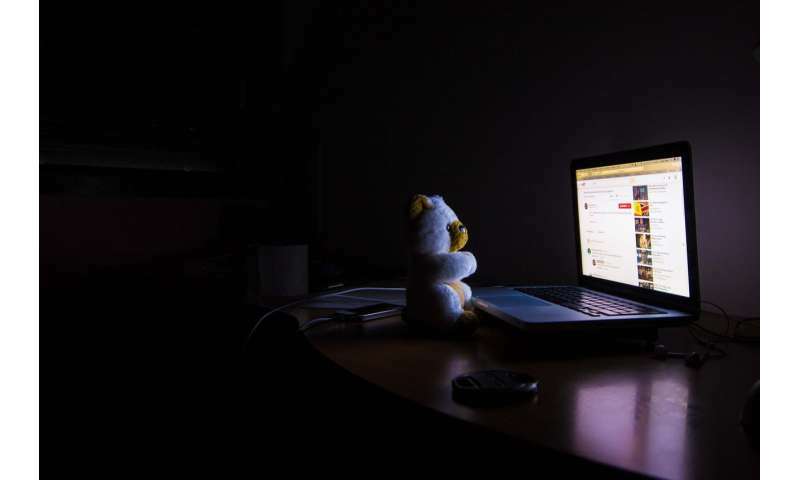 "Night owls trying to live in a morning lark world may have health consequences for their bodies," said co-lead author Kristen Knutson, associate professor of neurology at Northwestern University Feinberg School of Medicine. Previous studies in this field have focused on the higher rates of metabolic dysfunction and cardiovascular disease, but this is the first to look at mortality risk. The study will be published April 12 in the journal Chronobiology International. The scientists adjusted for the expected health problems in owls and still found the 10 percent higher risk of death. "This is a public health issue that can no longer be ignored," said Malcolm von Schantz, a professor of chronobiology at the University of Surrey. "We should discuss allowing evening types to start and finish work later, where practical. And we need more research about how we can help evening types cope with the higher effort of keeping their body clock in synchrony with sun time." "It could be that people who are up late have an internal biological clock that doesn't match their external environment," Knutson said. "It could be psychological stress, eating at the wrong time for their body, not exercising enough, not sleeping enough, being awake at night by yourself, maybe drug or alcohol use. There are a whole variety of unhealthy behaviors related to being up late in the dark by yourself." In the new study, scientists found owls had higher rates of diabetes, psychological disorders and neurological disorders? Genetics and environment play approximately equal roles in whether we are a morning or a night type, or somewhere in between, the authors have previously reported. "You're not doomed," Knutson said. "Part of it you don't have any control over and part of it you might." One way to shift your behavior is to make sure you are exposed to light early in the morning but not at night, Knutson said. Try to keep a regular bedtime and not let yourself drift to later bedtimes. Be regimented about adopting healthy lifestyle behaviors and recognize the timing of when you sleep matters. Do things earlier and be less of an evening person as much as you can. "If we can recognize these chronotypes are, in part, genetically determined and not just a character flaw, jobs and work hours could have more flexibility for owls," Knutson said. "They shouldn't be forced to get up for an 8 a.m. shift. Make work shifts match peoples' chronotypes. Some people may be better suited to night shifts." In future research, Knutson and colleagues want to test an intervention with owls to get them to shift their body clocks to adapt to an earlier schedule. "Then we'll see if we get improvements in blood pressure and overall health," she said. The switch to daylight savings or summer time is already known to be much more difficult for evening types than for morning types. "There are already reports of higher incidence of heart attacks following the switch to summer time," says von Schantz. "And we have to remember that even a small additional risk is multiplied by more than 1.3 billion people who experience this shift every year. I think we need to seriously consider whether the suggested benefits outweigh these risks." For the study, researchers from the University of Surrey and Northwestern University examined the link between an individual's natural inclination toward mornings or evenings and their risk of mortality. They asked 433,268 participants, age 38 to 73 years, if they are a "definite morning type" a "moderate morning type" a "moderate evening type" or a "definite evening type." Deaths in the sample were tracked up to six and half years later. Not a truly scientific study, since participants self sorted themselves into types. We definitely have morning and evening types of people. People who prefer to sleep late may really have a health disadvantage. But the proposed solutions mirror the recent spate of studies showing that children are being forced to go to school too early and it is reflected in their work. The solutions seem always to focus on changing work schedules for late risers and changing school schedules for late risers. * Work schedules are difficult or impossible to adequately move to preference. * School schedules closely match parents work schedules and would be a hardship for parents if changed. And, of course, changing the world to match late risers will likely harm early risers who will be forced to function at their lowest energy levels. The night owls, a notable number of them....probably don't want anything to do with a society and culture that is obviously fucked and loaded to the gills with a completely dysfunctional and widespread Dunning-Kruger mentality. At least at night, while the larktard aspects sleep, they can take a shot at finding some quiet form of balance. So, I suspect that some don't want to be night howls, but that they can't get away from the lemming off a cliff horror show that the world has been forced into becoming by an oligarchy that is just as clueless. An oligarchy that wants (and forcibly maintains as a pivotal power aspect) the world to be ignorant and off balance, so they can drive their desires for power and control into any shape their also illiterate selves may want.. The lark world doesn't tolerate well the night owl preferred sleep schedules. Studies have consistently shown that people that don't get enough quality sleep, have poorer health spans in general. Most night owls end up losing sleep because they are trying to necessarily fit into the lark world schedule. Therein likes the health problem. Gretchen, my 80+++ y.o. neighbor, full of energy and loves late night events. She comes home like at midnight and starts to eat, read, etc. through 3-4 pm. She complains that she cannot go to bed before 4 a.m. and cannot wake up early. But when I suggested easy possible solutions she said she loves it and do not want to change her schedule. This is only one example among many others that contradicts this study. Gretchen may be happy to participate in it. If researches contact me privately I can give her number to them.